FOXBOROUGH, Mass. – Houston’s Adam Moffat opened the scoring just over three minutes into the second half and a fortuitous bounce gave him a brace, as Houston took all three points on the road with a 2-1 win over New England. Saer Sene’s third goal of the season – a tap in from six yards out in the 55th minute – was the Revolution’s lone tally. In the opening goal, Andrew Driver’s corner was cleared out of the area by Chad Barrett in the 49th minute, but Moffat timed his hit perfect, nailing a driven shot – before the ball hit the ground – from distance that beat Bobby Shuttleworth, who seemed screened by the crowd in front of him from the corner. Just five minutes later, Lee Nguyen’s pass into the area was errantly cleared by Eric Brunner right to the feet of Diego Fagundez. The 18-year-old beat Andrew Driver down the line with speed and drove a low, hard cross into the six-yard box. Houston goalie Tally Hall was able to get a hand to it, but knocked it right to the feet of Sene, who was positioned between two defenders at the six. His first touch off his left foot put the ball on his right foot, where he calmly tapped the ball into the open net. In the 79th minute, Houston worked the ball up from the back, moving it outside before feeding it back inside. Ricardo Clark fed a ball to Moffat, who took a touch and ripped one from just outside the area. His shot banged off the inside of the post and then off the back of Shuttleworth, who had reached out for the original shot, and into the net. giveaway from Sene, allowing Andrew Drive to feed Jermaine Taylor into the area. Taylor’s shot was blocked by a sliding Stephen McCarthy. Houston nearly had their second goal in the 59th minute, after a long ball into the Revolution’s 18-yard box, a collision between Cam Weaver and Jose Goncalves allowed Giles Barnes to have an open shot, but it was saved point blank by Shuttleworth. New England had two solid chances to knot things at two, but Nguyen’s free kick in the 70th minute from just outside the area went over the bar and Rowe’s low cross into the area in the 87th minute saw Juan Toja’s touch go wide. It was a very physical match for both teams with 25 fouls called, two yellow cards (Andrew Farrell, 55’ & Eric Brunner, 69’) and a straight red card to New England’s Dimitry Imbongo for an elbow. The physicality was something that neither team seemed surprised about, with Moffat admitting it was in the game plan. Heaps agreed that the Dynamo planned for a physical game. Kinnear said every game you play is going to be physical, but also attributed the turf at Gillette as another factor. The win gives Houston some more breathing room above the Revolution and drops New England to 6-6-6. The Revolution have a quick turn around and a vital road trip, with three straight away games. First, the Revs travel to Colorado on Wednesday before heading to Columbus on Saturday. 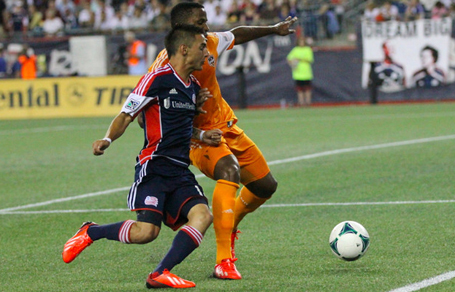 New England heads to RFK Stadium to battle D.C. United on July 27th. Revs were terrible in possession. try to force games at home.